Power to the Tracker! Now you can get tracks anywhere! 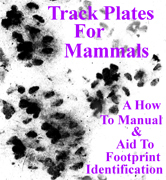 Track Plates are ingenious devices which allow tracker's to obtain footprints of elusive mammals. Plates may be used in places where natural substrates do not allow tracking such as inside buildings or on hard ground. Each plate has a coating which sticks to an animal's foot until it walks across a piece of sticky paper and leaves footprints behind. Footprints are then preserved with clear contact paper in a "track sandwich." The sandwich may be copied on a photocopier or digitized for archieving. Measurements may be made on the track sandwich. Track plates allow you to explore the hidden world of what lurks when you are not looking. Plates are used by professional ecologist to find rare and endangered species by non-invasive censusing.